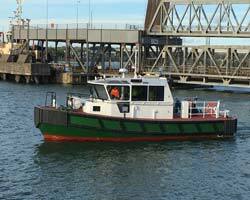 UK boatbuilder Mainstay Marine has delivered a brand new crew transfer vessel (CTV) to a Scottish tug owner and operator, as part of a contract distinguished by a “short build timescale”, the boatyard reports. Measuring 14.99m x 4.8m overall and drawing approximately 1.6m, the vessel, which was designed by Scotland’s Camarc, has been handed over to Targe Towing, which provides towage services to a number of ports in Scotland’s north east, including BP’s Hound Point Marine terminal on the Firth of Forth. According to Mainstay Marine, as of mid-July, the boat has already spent two months operating alongside oil terminal platforms on the east coast of Scotland, where she has encountered swell conditions of up to 2m Hs. Other vessel features include: 3,000litres of fuel capacity; a range of 15 hours at 100% MCR; and a lightship displacement of approximately 26tonnes. Power is supplied by a pair of 4-stroke Volvo Penta D13-450 diesel engines, each rated 331kW at 1,800rpm, driving ZF Marine hydraulic gearboxes. The vessel has a top speed of 15knots in calm conditions, Mainstay Marine adds. A Kohler generator, meanwhile, provides 7kW of shipboard power. Mainstay Marine would appear to be making leaps and bounds in the marine sector once more, having rebranded itself in July 2015 after its previous incarnation, Mustang Marine, went into administration. For example, the yard claims to have boosted its turnover from just under £4 million to £5 million (US$5.2 million to US$6.5 million) in the past 12 months, and has grown the onsite workforce at its Pembroke Dock facility to 80 employees – an estimated 10% of whom comprise apprentices.